OH MY – The Brighton Rockers TAKE ON a Marathon FUNDRAISING CHALLENGE! It’s seems like the Brighton Rockers have gone skating mad this spring. They’ve just hosted two open door events within three weeks of each other – the shortest gap between home events in the league’s history. If that wasn’t enough they followed up Sunday’s battling 142-181 defeat to Croydon by holding a closed door intraleague (half the Rockers roster taking on the other half) the very next day! What are they going to do next – skate a marathon? Who from the Rockers is taking part in Sunday’s South Coast Roll? There’s loads of us going; Skate Bush, Speedy Gonzalex, Hippy Hippy Skate, ZoWhat, Lauren SmackAll, Bloody Elle, Irish Mist, Chloe Colossus, Sutherland, Obliviator, Feisty McGee and Polly Dartin, to name a few. How far are people planning to skate? Everyone’s aiming to do a full marathon! Eleven laps of the 2.4 mile circuit. Are many of those taking part used to skating such long distances? EVERYONE! We Rockers are nothing if not optimistic! What are you raising money for and how can people donate? We’re raising money to keep the league rolling along, so that we can get more people involved with the Rockers, and keep costs down for new people joining us. We love derby and we want everyone to have the chance to take part. Please donate whatever you can at tinyurl.com/brrdsponsor – thank you! How have you been preparing for the event? We do quite a lot of stamina and cardio work in training. And we always end up dancing at after parties, usually whilst belting out power ballads, so we think we’re probably ready for anything. Who do you expect to skate the furthest/fastest and the slowest/shortest? Furthest will be Hippy Hippy Skate – she’s definitely the one with the best past form. Fastest will be Speedy Gonzalex – it’s in the name really. Slowest and shortest will be Skate Bush and Irish Mist – they’ll be too busy chatting and showing off their questionable figure skating ‘skills’. 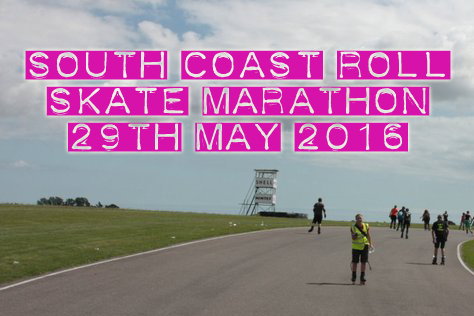 The South Coast Roll takes place this Sunday from 11am-4pm at Goodwood racing circuit, just north of Chichester. If you fancy cheering the Rockers contingent (and all the other skaters) along, admission is free for spectators. This entry was tagged Brighton Rockers, Goodwood, roller derby, roller skating, skate marathon, South Coast Roll, sport, women's sport.